به‌دنبال تأسیس انجمن آموزش مهندسی ایران ایجاد سازکاری برای ارزشیابی برنامه‌های آموزش مهندسی در دستور‌کار قرارگرفت. این بررسیها به تأسیس سازمانی مستقل برای ارزشیابی برنامه‌های آموزش مهندسی کشور منجر شد. وظیفه اصلی این سازمان اعتبار‌سنجی کارایی برنامه‌های آموزش مهندسی کشور است. میزان کارایی یک برنامه آموزشی با تواناییها و دستاوردهای کسب شده دانش‌آموختگان آن سنجیده می‌شود. پیش‌نیاز هر فرایند ارزشیابی، ارزیابی درونی برنامه توسط خود مؤسسه آموزشی است. ارزیابی درونی با تعریف هدفهای برنامه و درسها، برحسب دستاوردهای یادگیری دانشجویان، آغاز می‌شود. سپس، روشهای ارزیابی انتخاب و با استفاده از آنها داده‌های مناسب گردآوری می‌شود. مرحله نهایی این فرایند تبدیل داده‌های گردآوری شده به‌ اطلاعاتی است که اعمال آنها به‌ بهبود برنامه منجر شود. ارزیابی درونی حالتی چرخه‌ای و مداوم دارد و بازخوردهایی که از هر مرحله گرفته می‌شود، بر اقدامات بعدی تأثیر می‌گذارد. حاصل ارزیابی درونی پرسشنامه تکمیل شده‌ای است که همراه با مستندات لازم برای مؤسسه ارزشیابی ارسال می‌شود. ارزیابی درونی زمانی قابل بررسی توسط مؤسسه ارزشیابی است که به‌‌گونه‌ای استاندارد انجام شده باشد. هدف این مقاله پیشنهاد رویه‌ای اجرایی برای ارزیابی درونی برنامه‌های آموزش مهندسی کشور است. این الگو، با توجه به‌ برایند آنچه در سطح جهان به ‌ویژه در آمریکای شمالی رایج است، تدوین شده است که پس از تصویب به‌عنوان رویه مورد تأیید سازمان ارزشیابی آموزش مهندسی ایران به‌کار گرفته خواهد شد. 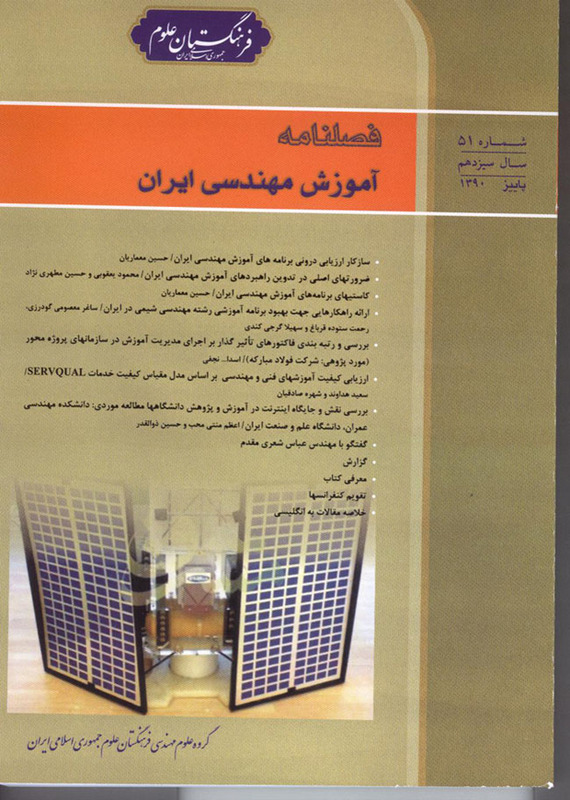 Following the establishment ofIran’s Engineering Education Association, executing a mechanism for accreditation ofIran’s engineering education programs became a priority in the action plan. These assessments led to the foundation of an independent organization for the country’s engineering education accreditation. The main responsibility of this organization is to verify the efficiency of country’s engineering education programs. The efficiency of an educational program is measured on the basis of the capabilities and outcomes acquired by its graduates. The prerequisite of any accreditation process is the internal assessment of the program by the educational institution itself. Internal assessment starts with defining the objectives of programs and courses according to students’ learning outcomes. Then, assessment methods are selected and using them, appropriate data is collected. The final stage of this process is to transform the collected data into information that can be applied to improve the program. Internal assessment has a cyclic and constant nature and the feedback from each stage affects the subsequent procedures. The result of internal assessment is a completed questionnaire that will be submitted to the accreditation organization along with the required documents. Internal assessment can be assessed by the accreditation organization only when it is done in a standard fashion. The purpose of this paper is to propose a practical paradigm for internal assessment of engineering education programs inIran. When legislated, this paradigm, which has been compiled on the basis of the outcome of popular paradigms in the world as well asIran’s needs, will be used as the approved paradigm of the Engineering Education Accreditation Organization of Iran.